Submitted by iancamarillo on Wed, 2013-01-16 20:45. If I use the Preview Method: "Grab Viewport" (because I want to make 4k previews) and use h.264 compression with quicktime, the gamma looks close. But I'm not sure. is there another work around for outputting large scale sequences? Submitted by osmanzort on Thu, 2012-12-13 15:14. Thanks so much for your effort, I'm sure this will be very useful in real time works like the game industry. I don't know how to run a script so I couldn't try it out. Can you post a simple method to run it? Submitted by spacefrog on Wed, 2012-07-11 01:30. I guess you talk about the pre-calc phases PFlow does when you scrub the timeline and i asume you are not talking about some disk caching features? As PowerPreview does nothing PFlow related, i think this is simply because those pre-calcs do not survive when you scrub the timeline in largers steps too.. Submitted by spacefrog on Wed, 2012-07-11 01:19. If some frames are of bad quality, you might try to disable the "Iteration Limit" button, which is on by default. When this is on, PowerPreview simply counts the redraws in the viewport and progresses one frame after the limit is reached, as nitrous redraws the view after each refinement step. But this can cause some frames to be skipped too early from time to time, because other things might trigger redraws too. Submitted by darthsaschi on Wed, 2012-07-11 01:01. Thank you for that incredible script. For me it replaced the standard-preview completely. I have a little problem: when I use PFlow PowerPreview kills all caches whenever I start it - and the caches (rebuilt while preview) are killed again when the preview is finished. This eliminates the advatages of the PFlow cache-system when using PowerPreview. The standard-preview does the same, at least the cache-killing when starting the preview, so I think it´s not really a PP-related problem - but do you think it can be solved? Submitted by mhdmhd on Tue, 2012-07-03 14:10. Your tool is very nice and fast, why is it faster than quicksilver(isn't it the same tech?) at the same quality even double the resolution? Submitted by 1k0 (not verified) on Thu, 2012-06-07 20:36. A BIG Thank you Spacefrog, your script helped me to complete my last project on time by rendering characters with PowerPreview! It made an incredible work, can't wait to see the coming improvements. Submitted by spacefrog on Fri, 2012-05-04 01:07. Currently i'm again under heavy workload with money earning jobs, thus my silence and short reply. Submitted by Gspoutnik on Sun, 2012-04-29 08:59. Hidden objects remain in the dynamic reflection. I did a test with a skinned character rig with a Cat. I masked the Cat, but rest visible in the sphere I created with an arch design & chrome. Today i do an other test with the same scene and no more problem with Hidden objects in the dynamic reflection. I think it's just the viewport update. Submitted by Gspoutnik on Sun, 2012-04-29 09:01. Can you explain how to use PowerPreview with Gamma settings. I use as I think everyone, a Gamma 2.2 and MR Exposure. But if I made ​​a GoNitrous, my film is dark with bad Gamma. If I disable the Gamma but with Mr exposure On, the viewport is washed out and Preview, WYSIWYG, then washed out as well. If I disable Gamma and Mr exposure, I have to redo all my lighting but the preview is correct. 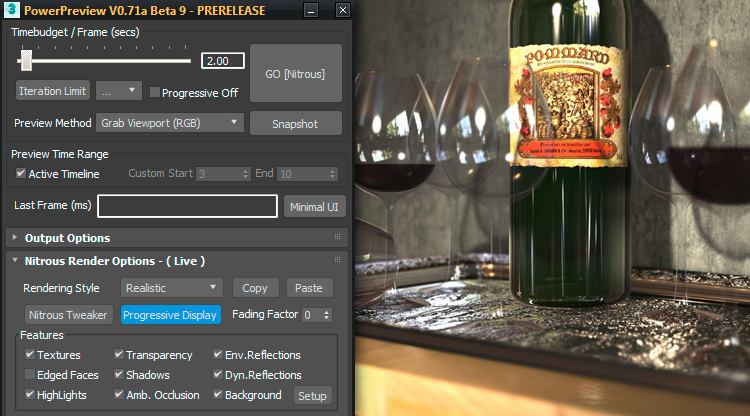 I hope that there is a better workflow to use than mine with Powerpreview and Mr exposure,because I find it just great. 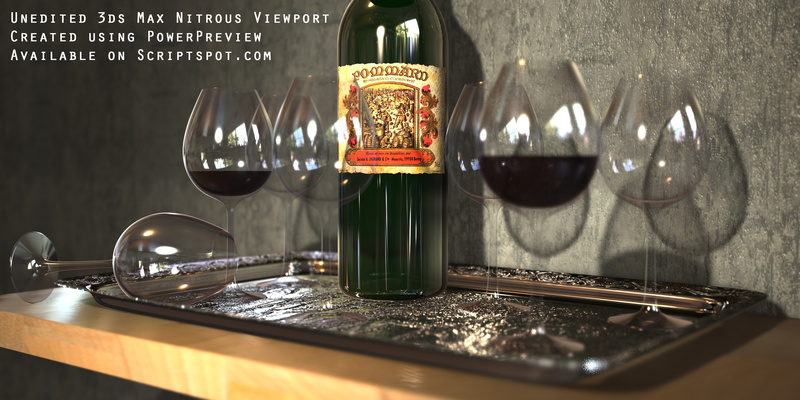 With 3dsmax 2013 now we can use a. mov file with lots of codecs, rendering with Powerpreview becomes incredible.